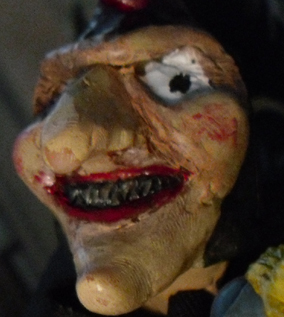 The puppet in question is a head made of sculpy on a Toby Zed body with a black cloak. 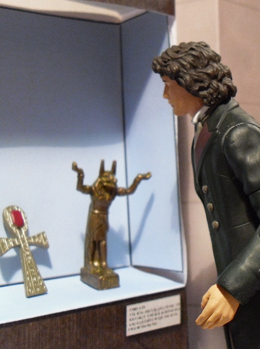 The curator figure was originally created to play the Time Lord Daedelus in the original draft of the 10th Doctor finale that eventually became Godmaker. Punch and Judy shows take their roots from the Italian commedia dell'arte (literally comedy of craft). One of the proposed titles was Commedia Della Morte- comedy of death. Part One was posted on 12th March 2011 with part two following a week later on 19th March. 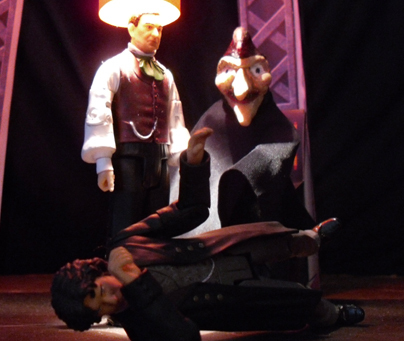 The Punch puppet was kept under wraps for all publicity material, appearing as a blur or in shadow only. The title went through several changes beginning with Night In The Museum. Storylining for this adventure began in early September 2011. The inspiration was to take something scary and let it run amock. 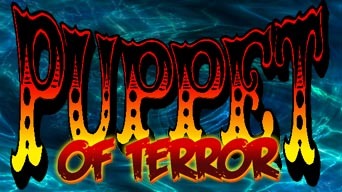 I find clowns and puppets very creepy and this series was about tapping into that kind of horror. I did a lot of research into the story of Punch and Judy and came up with the idea of misinformed puppet that believes it has to play out the story, albeit in a loose form. The museum setting was a relatively late addition to the storyline which saw Mr Punch draining his victims of blood in a desolate urban setting. Other ideas were setting it in a derelict fun fair and having Mr Punch steal souls or futures, a nearby hospital containing children who have been in comas for thirty years. To simplify the story, and to give us at least one 'modern day' setting, I decided upon the museum. By tying the plot more closely to the Punch & Judy story, the other characters presented themselves. One of the enemies Punch encounters and actually fails to see off is a crocodile, hence the Doctor's use of a croc in the museum. This story was shot first since the museum was pretty much one set with walls that could be shifted and redressed for different areas of the museum. 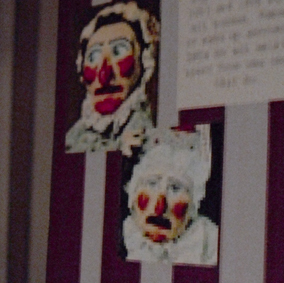 Some sets were required for day time and night time shoots such as the Punch and Judy exhibit and the main hallway. Among the many artefacts are accessories from the Indiana Jones figures including the chalice that Judith attempts to steal (the fake Holy Grail) and Mola Ram's sinister skull goblet. Among the animals in the 'neolithic' section are King Kong, Penguins from Batman Returns and Dodos from Primeval. A mummy from Pyramids of Mars can also be seen in the main hall with his generator loops and a Micronaut Pharos sarcophagus. The final scenes to be filmed were the TARDIS interiors (7th Jan) which used the same interior as the Doctor's TARDIS with the column replaced by an orange tube and the addition of the consoles previously used in the Master's TARDIS in The Gift of the Benevolence. This was the third story to complete editing. A lot of dialogue was added and changed in the edit. Originally it was Angel's choice to come to the library with the Doctor bemoaning her choice. The Doctor's ad-libs on the first page of part 2 were all added in the edit. It was also intended that Mr Punch got a bit more physical with the Doctor as he tries to free Mr Ellison but that was cut due to space. Yes, this is supposed to be The International Gallery that appeared in several episodes of Doctor Who, Sarah Jane and curiously Sherlock Holmes, though I erroneously called it the National Museum on last week's home page blurb. We're in the 21st Century but probably in the early years, certainly before 2010.